The RP Photonics Buyer's Guide contains 16 suppliers for vertical cavity surface-emitting lasers. Ask RP Photonics for advice on VCSELs and VECSELs. VCSELs are semiconductor lasers, more specifically laser diodes with a monolithic laser resonator, where the emitted light leaves the device in a direction perpendicular to the chip surface. 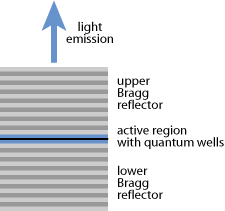 The resonator (cavity) is realized with two semiconductor Bragg mirrors (→ distributed Bragg reflector lasers). Between those, there is an active region (gain structure) with (typically) several quantum wells and a total thickness of only a few micrometers. In most cases, the active region is electrically pumped with a few tens of milliwatts and generates an output power in the range from 0.5–5 mW, or higher powers for multimode devices (see below). The current is often applied through a ring electrode, through which the output beam can be extracted, and the current is confined to the region of the resonator mode using electrically conductive (doped) mirror layers with isolating material around them. Figure 1: Schematic gain structure of a VCSEL, without substrate, electrodes for pumping, structures for current confinement, etc. VCSELs can have a good beam quality only for fairly small mode areas (diameters of a few microns) and are thus limited in terms of output power. For larger mode areas, the excitation of higher-order transverse modes can not be avoided; this is a consequence of the extremely small resonator length of only a few microns, and the difficulty in homogeneously pumping a larger active region with a ring electrode. The short resonator, however, also makes it easy to achieve single-frequency operation, even combined with some wavelength tunability. Also, VCSELs can be modulated with high frequencies, making them useful e.g. for optical fiber communications (see below). In addition to the high beam quality of low-power VCSELs, an important aspect is the low beam divergence, compared with that of edge-emitting laser diodes, and the symmetric beam profile. This makes it easy to collimate the output beam with a simple lens, which does not have to have a very high numerical aperture. The most common emission wavelengths of VCSELs are in the range of 750–980 nm (often around 850 nm), as obtained with the GaAs/AlGaAs material system. However, longer wavelengths of e.g. 1.3, 1.55 or even beyond 2 μm (as required for, e.g., gas sensing) can be obtained with dilute nitrides (GaInNAs quantum wells on GaAs) and from devices based on indium phosphide (InAlGaAsP on InP). There are also optical amplifiers which are very similar to VCSELs: they are basically VCSELs with reduced top mirror reflectivity. See the article on semiconductor optical amplifiers. An important practical advantage of VCSELs, as compared with edge-emitting semiconductor lasers, is that they can be tested and characterized directly after growth, i.e. before the wafer is cleaved. This makes it possible to identify quality problems early on, and to react immediately. Furthermore, it is possible to combine a VCSEL wafer with an array of optical elements (e.g. collimation lenses) and then dice this composite wafer instead of mounting the optical elements individually for every VCSEL. This allows for cheap mass production of laser products. Another interesting feature of VCSELs is the long lifetime, as there is no facet which can be damaged by high optical intensities. Much higher powers can be generated with VCSEL arrays. A 2-D VCSEL array containing many thousand emitters (with a spacing of some tens of microns) can emit several tens of watts continuous-wave, thus competing with diode bars and (combining multiple arrays) even with diode stacks based on edge-emitting semiconductor lasers. VCSEL arrays can also generate such high output powers with a high wall-plug efficiency. The output power can simply be scaled up (“power scaling”) by increasing the number of emitters. The effective beam quality is of course much reduced (comparing with single VCSELs), as the emission comes from a much larger area while the beam divergence equals that of a single emitter (which is smaller than for an edge-emitting laser but still substantial). Note that emission from the VCSELs is usually not usually coherent; therefore, the intensities of the single emitters are simply added up. Emission linewidth of VCSEL arrays can be very small, and the emission wavelength has a lower temperature dependence than that of a conventional laser diode. This is because the mission wavelength is essentially determined by a cavity resonance and not by the gain maximum, and cavity resonances have several times smaller temperature coefficients. They are influenced only by the temperature dependence of the refractive index and not by carrier densities involving Fermi distributions. Quite high peak powers are possible in pulsed operation with nanosecond to microsecond pulse durations. Even in pulsed operation, the device reliability can be high: catastrophic optical damage (COD) can usually not occur due to the moderate optical intensities. VCSELs have many applications, the most important of which are briefly discussed in the following. Due to the short resonator round-trip time, VCSELs can be modulated with frequencies well in the gigahertz range. This makes them useful as transmitters for optical fiber communications. For short-range communications, 850-nm VCSELs are used in combination with multimode fibers. A data rate of e.g. 10 Gbit/s can be reached over a distance of a few hundred meters. An application area which was developed later, but has acquired a large market volume, is that of computer mice. A laser mouse with a VCSEL as light source can have a high tracking precision combined with a low electricity consumption, as is important for battery-powered devices. Another prominent field of application is gas sensing with wavelength-tunable VCSELs. Such devices are built e.g. as MEMS VCSELs, having a separate output coupling mirror the position of which can be tuned via thermal expansion, electrostatic forces, or a piezoelectric element. In this area, VCSELs partially compete with distributed feedback lasers (DFB lasers), but offer a smaller drive current, a wider tuning range and a higher modulation speed. 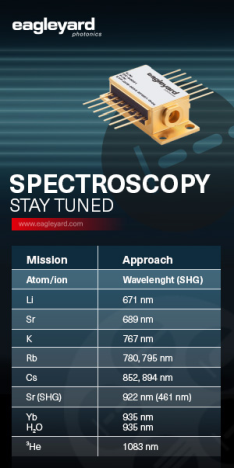 Optical oxygen sensors are of particular importance, because an absorption line at 760 nm is in reach of GaAs-based VCSELs, whereas longer-wavelength VCSELs which could be used for detecting water vapor, methane, or carbon dioxide need some further development before widespread use. VCSELs can also be used in miniature optical clocks, where the laser beam probes an atomic transition in cesium vapor. Such clocks could become part of compact GPS devices. A more exotic, but nevertheless potentially important project is the thresholdless laser. VCSELs are interesting in this domain because they allow the utilization of quantum effects related to the modification of the mode density by the cavity. With such a technique, a threshold current of only 36 μA has been demonstrated . Due to their high output powers, VCSEL arrays can often compete with diode bars (partially even with diode stacks), e.g. for pumping solid-state lasers. RPMC Lasers offer a wide selection of vertical cavity surface emitting lasers (VCSELs) in the 850 nm, 860 nm, 940 nm, and 975 nm, with 1550 nm under development. Our VCSELs are available in standard packages and are capable of being delivered in reasonable quantities in relatively short order. Higher volumes, specific packaging, and alternate power requirements are possible.